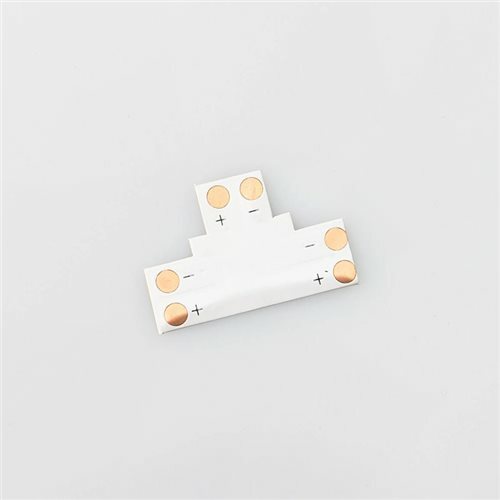 The T shape wired can be used with up to three in-line joiners (LEDCLJ2PIN8 or LEDCLJD2PIN8) to allow a quick connection of up to three LED strips. Easy to fit allowing solderless connection. Just unclick the upper part on each free end of the joiners then carefully push each end of the wire inside the joiners until the PCB pad fits below the 2 pins. This wire can carry a max. current of 3A (so 72W at 24V or 36W at 12V). Fixing - we strongly recommend the use of a double adhesive tape underneath the joiners or the use of silicone. This will fix the devices in place protecting the start of the LED tape on the long run.